It’s not every venue that can satisfy a performer when, at the sound check a few hours before the gig, he requests a Bösendorfer grand to replace the Yamaha. 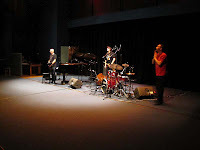 But this was the Band Room at the ANU School of Music, and the changeover and the associated tuning happened for the gig to go ahead on time. The fact that it was even requested is evidence of the style of the night. This is ECM Euro jazz, so honky tonk is out, as is thundering and abandoned playing. 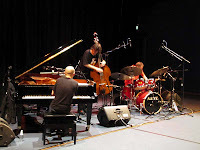 This is delicate, controlled and intelligent music, obviously influenced by the classical training and traditions that are common in European jazz players, although still clearly in the jazz idiom. Not third stream, but not torrid either. I last heard this band when they appeared as the backing trio for Thomas Stanko a few years ago at a private embassy gig here in Canberra. 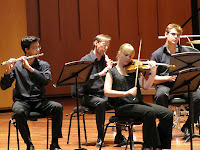 This time, they were touring for Sydney and Perth Festivals, and presenting their individual piano trio voice. 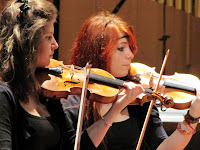 It’s formal and considered, and despite a few pop tunes, is in the mainstream of modern European playing. 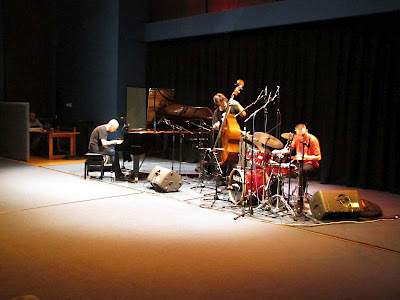 I think Keith Jarrett and to a lesser extent, Dave Holland, when I hear them, and they played tunes by Keith Jarrett, offsider Gary Peacock and Carla Bley. But they also played Prince and they’ve recorded Bjork’s Hyperballad, so partaking of a current theme of reinventing the standards repertoire with a new generation of popular tunes. I like all this. And I liked the band, very much. I wasn’t the only one. 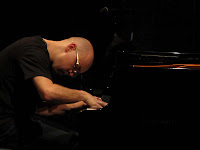 Marcin Wasilewski was richly harmonic on piano, free to move through keys and dissonances, but disciplined and tempered in his approach to the keyboard and his fine little melodic lines. I noticed later in the night, as the volume lifted and there was a bit more abandon, that he was disappearing under the drums, so he’s presumably not a loud player. He’s more a player who feels every key. Not to say there were no dynamics (there were) but they were circumscribed. 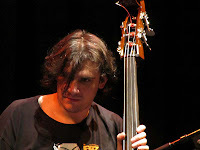 Slawomir Kurkiewicz played a Czech-Ease travel bass with those soft Velvet strings for good, solid modern syncopated lines and just one walk that I noted during the night. It was close rhythmic playing with the piano, with a few very good solos, but I particularly noticed the reliable intonation. Perhaps it’s evidence of more classical training. 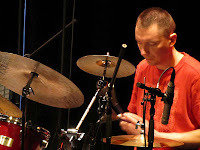 Michal Miskiewicz was using borrowed drums, and I found some of the tom tones to be a bit woolly, but he played with consistently changing rhythms and again a closeness with the others. To me, it was this closeness that was the highlight. Rhythms that moved through the players, in contrast or in sympathy, with that underlying syncopation from the bass. It wasn’t clearly swinging, although I guess there was some swing there, but more patterns of dotted notes and straight triplets and quavers that hinted of the classical charts I only attempt to sight read. Tunes and improvisations that display a Western classically-informed conception of how to place notes in time to form melody. The stage presence was of a type with the seriousness of the music. Marcin just once spoke to the audience to list the tunes they’d played, and this was short and I missed most of it. 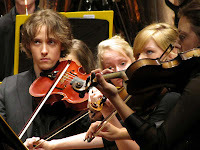 He spoke English well enough (trust the Europeans to be so international) but this was a serious event we were offered. It led to a quiet and subdued night: more highbrow and perhaps less enjoyable than it could have been. 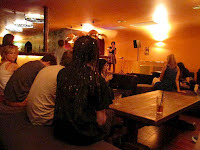 But the crowd was good, the venue was intimate and quiet (and well provided), the music was accomplished, and ArtSound was there to record and later replay on some Friday Night Live. So this was a wonderful performance, if quiet and absorbed. A good sign for jazz in Canberra and worthy audience to keep us on the touring circuit. 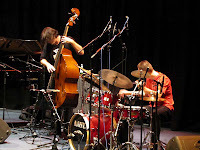 The Marcin Wasilewski Trio comprised Marcin Wasilewski (piano), Slawomir Kurkiewicz (bass) and Michal Miskiewicz (drums). 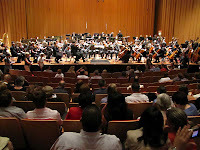 The fifth and final concert for my AYO program was another orchestral concert. 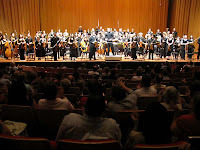 The Tuckwell Chamber Orchestra, the Alexander and Bishop Orchestras preformed almost their final fling for this year’s National Music Camp to one of the biggest audiences I’ve seen at the Llewellyn Hall. This series has created quite a stir amongst Canberrans. 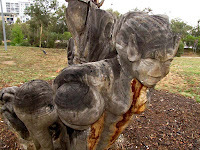 I understand these camps are held in Canberra on alternate years, so we can expect another big week in January 2012. Looking forward to it already. 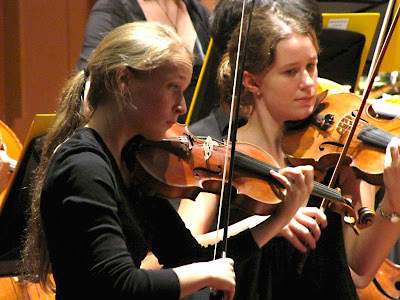 The Tuckwell Chamber Orchestra commenced the program with two very different pieces. The first was another early, stately piece, Purcell’s Double dealer. It was written to accompany a Congreve play of 1693 that spoke of lies, deception and adultery, but this stands proudly on its own. The form is a lengthy overture, followed by eight shorter dances and airs of differing feels and time signatures. The Tuckwell performed it in an unequal temperament, which perhaps challenged some players but suited the style. 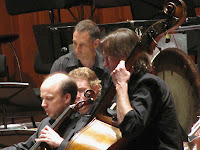 The Tuckwell also performed Vaughan Williams’ Fantasia on a theme of Thomas Tallis. Tallis was composing around 1570, but this was a piece of 1910 so, despite the themes of Tallis providing the starting point, I heard this as romantic: shimmering violins and emotive crescendoes; imploring violins and expectant cellos; sweet melodies that spoke of a more recent era than Tallis’s. I despair of musical borrowings for film and TV (Carmina Burana and Nescafe is my most annoying connection), but this reminded me of films, perhaps Lawrence crossing a desert. Suffice to say I preferred the authentic early music of Purcell. 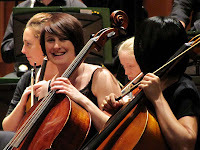 The Alexander Orchestra followed with my favourite music for the day, Webern’s Passacaglia in D minor, Op. 1. It’s a student work that preceded his serialism, but still it must have been challenging at the time. 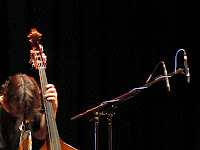 It started with pizzicato and within bars had exploded into power and volume, to retreat with a string-smooth recovery, only to take off again like a rocket, and again, and again. Was it four times? Brass had a nice role here, not surprising given the volume and impulsiveness of the loud passages. I was writhing in my seat from the extremity of it all, and crushed as if with extra G-forces. Fabulously excessive and brilliant and overwhelming. Loved it! 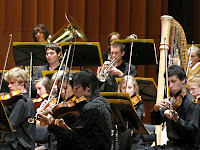 Last was the Bishop Orchestra with Richard Strauss’ Don Juan, Op. 20 of 1888. This was a bit earlier than the Webern but an era away in history. 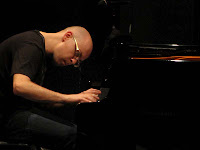 I had expected volume and passion, but there was nothing like the complexity and excitement of the Webern. It was plenty loud and emotional, but I felt this work spoke to the past, whereas the Webern spoke to the future. I heard dances or horses galloping through the woods. In fact, at one time I pictured ‘60s cowboy-Roman epics and galloping gladiators. Perfectly well played, but just not so thrilling. So ended my week with the AYO. It was wonderfully educative, both for them and me, and emotionally satisfying and an intellectual treat. Thanks to all. No need to ensure everyone had a good time, because the excitement and commitment and enjoyment of the players and the staff (and the audience) was manifest. Looking forward to 2012. 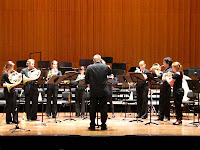 The Australian Youth Orchestra’s Brass Ensemble was my third outing for the National Music Camp. Classical brass has a bell-like clarity that we don’t really hear in the jazz idiom, and it’s delicious. The trumpets (especially the little pocket trumpet) and trombones and even the big tuba ring with clarity that carries a mile. I guess it’s fewer overtones and big, sine-wave fundamentals that do it. 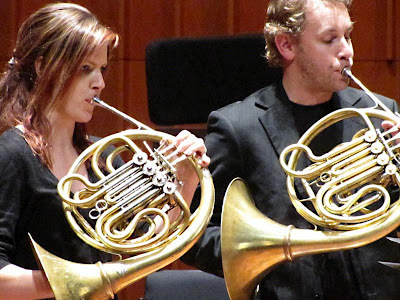 I’m not too clear on this, but the cornets, with their differently shaped tubes (conical rather than straight then flared) sound softer and more intimate and perhaps closer to the French Horn, which also has conical tubing. The French horns sound different again to my ears, fatter and more a belching rather than clinical sound. When together, they sound so pure and swell so excitingly that it can give me goosebumps. 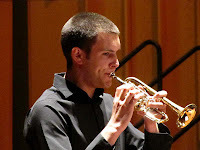 And there were swells and courtly sounds a-plenty at the AYO Brass concert. Like the Percussion concert, the brass players presented a range of styles and eras, although I didn’t feel the same sense of variation that I did with the percussion. Definitely the timbres were more consistent with the brass, but maybe also the musical conceptions. 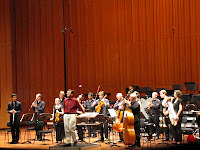 At one stage, a leader jokingly congratulated the audience for staying so long at a brass concert. 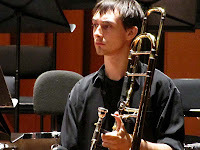 It was self-flagellating, but brass can have such long periods of counting rather than playing on the symphonic stage, that I can understand the feelings. 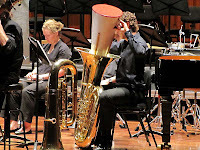 I attended with a mate who had played trombone in the Melbourne Youth Orchestra, and he commented that the pieces were only of a moderate level of difficulty, so there wasn’t quite the excitement of the virtuosic, speedy lines that classical players seem to master with ease. 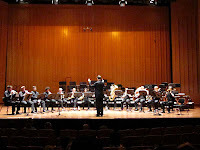 The ensemble sat in a semicircle with the conductor at the apex and the players moved in and out for the different pieces: trumpets to the audience’s left, through horns and tubas to trombones at the right with percussion over their shoulders. The program started with early courtly music, Lully’s Music for the Sun King: a familiar melody and one that highlighted the bell-like beauty of the sound. 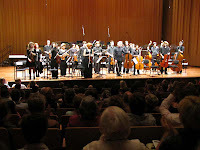 Then a modern Australian arrangement of Wagner called Elsa’s procession that sounded of chromatic movements and swelling, gut-wrenching sounds. 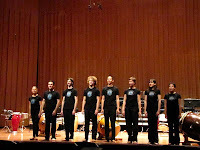 Third, a contemporary Australian piece, Siegfried fantasy by Matthew Hindson, with more dissonant harmonies and frequently changing time signatures and some repetitive rhythms and chordal movements that reminded me of jazz. 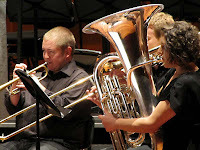 Then eight French horns playing a modern piece that won a major international composition competition for horns: Stanhope’s Retreat and pumping song. This had two movements, including what seemed like a call to the hunt. Fitting for retreats or pumping, I’m sure, but not my favourite. Then back in time to JS Bach’s Passacaglia and fugue in C minor which was stately although busy with constantly changing scalar lines bouncing between instruments, and had a final cadence that sounded to my ears just like big pipe organ chords. I guess it’s those overtone structures, again. Then more big swelling chords in Grieg’s Funeral march. Grieg wrote this piece for a friend who died suddenly, and it was also played at Grieg’s funeral. The drum pattern clearly suited the funereal ambience, but some chordal and melodic movements seemed jagged and out of place and didn’t work for me: not a favourite. And a finish with another Australian arrangement of Wagner, Sigfried’s twilight, with repeating quaver pairs that apparently reference Wagner’s bi-syllabic character names. This was another exciting piece of swelling chords sounding like endless emotional resolutions and discovered sunsets. 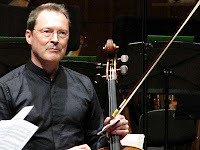 So a capable concert with blissful clarity and swelling emotions and often dignified melodies and a fabulous intellectual encounter with Bach, but a bit short on virtuosic flings and tonal variation. Well played and very much enjoyed but I left feeling just south of elated. 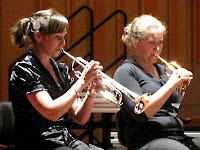 The Brass Ensemble comprised: French horns – Jessica Armstrong, Julia Brooke, Sebastian Dunn, Emma Gregan, Angharad Johnson, Claire Lindquist, Sharn McIver, Kartini Suharto-Martin, Gillian Williams, Andrew Young; Trumpets – Daniel Ballinger, Dee Boyd, Christopher Day, Callum G-Froerer, Daniel Henderson, Louisa Trewartha; Trombones – Alistair Crawford, Matthew Harrison, Michael Ingle, Andrew Nissen; Bass trombones – Mitchell Nissen, Cassandra Pope; Tubas – Karina Filipi, Mark Leese; Timpani / Percussion – Joel Bass; Tutors – Andrew Bain, Shane Hooten, Nick Byrne, Gary McGibbon. 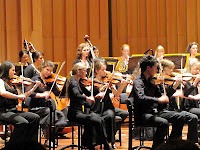 I’m taking whatever opportunity I can to hear the Australian Youth Orchestra while they’re in town. 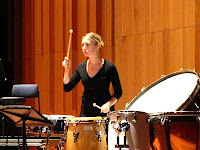 My second concert was the Percussion Ensemble and it was a hugely varied performance which was truly thrilling. 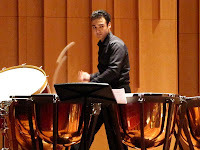 I had struggled with classical percussion before and was never quite convinced, but this was different. This performance was varied and entertaining and occasionally overwhelming, and a great introduction to the art. The first piece was meditative with long, ringing cymbal passages contrasting wildly with tympani and bass drum hits and features, all under discrete conductor control. 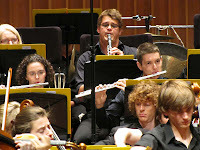 It was a piece entitled Die Welle by Swiss percussionist Fritz Hauser (who I think I’ve heard in the Band Room). I found this a bit challenging to enter, especially soon after a busy day at work, but its calming and involving role was evident as the program continued. 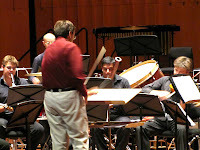 The piece that followed was Peaux by Iannis Xenakis from his larger piece, Pleiades. Xenakis wrote more widely, but was introduced here as the “Beethoven of percussion”. From this I guess classical percussion must be a new idiom, as he only died fairly recently. 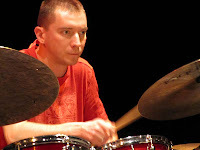 Peaux was a mathematically informed, clearly structured poly-rhythmic piece that says percussion to me. I felt more comfortable with this piece than the previous one, I think because its essence is defined by rhythm and pitch rather than timbre (much more jazz-like). Six players each had stood in an island of drums for a total of 44 drums on stage. 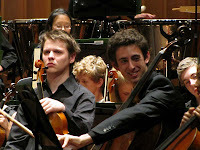 The players were widely separated and arranged in a semicircle across the Llewellyn stage, with a conductor off stage centre. 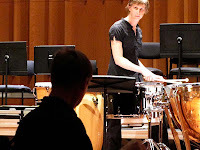 The complement of drums varied slightly between players, but was very close to this: four players with bongos, one conga, two toms and a tympani; two players each had an additional mounted bass drum. All played with sticks. Imagine the complexity of pitch and rhythms that’s possible. This was loud and varied and grooved with hugely complex interplays and occasional solo-like features. Fabulous. Piece three was Djilile by Australian Peter Sculthorpe. PS is renowned for representing the Australian experience. This piece borrows from an Aboriginal melody of the north (Kakadu?) 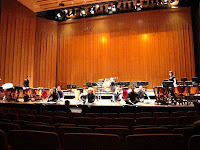 and was commissioned by the Sydney percussion ensemble, Synergy, and premiered at the Adelaide Festival of Arts in 1990. It starts and ends in the dark with the sounds of thunder, so it’s obviously of the top-end. 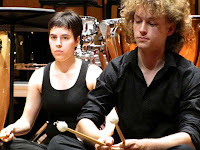 The core (excluding the thunder) is played by 3 musicians sharing one marimba, and a fourth on vibraphone. The core is a pretty and beguiling tune and I seem to remember an insistent bass riff or lower pitched chord pattern which spoke of popular song. I particularly enjoyed the contrasting timbre of the toneful but thuddy wooden marimba against the sustained and reverberent, metallic vibraphone. 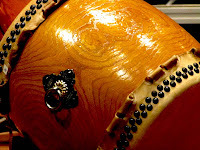 The last piece moved further afield to Japan and its taiko drumming tradition. It was called Yataibayashi, and was a TaikOz arrangement of traditional music from a day-long festival held annually in a Japanese village for the last 350 years (I missed the details). 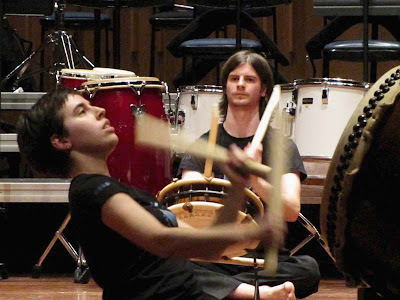 This was performed by 8 players on three large taiko, four small taiko, and a triangle-like instrument that played a surprisingly cutting metronomic eighth-note beat throughout the performance. 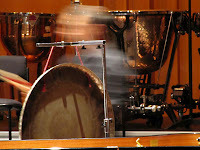 I noted the formality of presentation and performance, the different Japanese-style techniques including heavy mallets held in clenched fists, the repetitive rhythms, and what seemed to be a totally square (I mean notes spilt into two not three and unswinging) rhythms. And the volume and the sweat and strained muscles on the performers, of course. I guess this was new to some of these performers, but they did it well, and the audience loved it. Powerful and steady and insinuating and Japan-formal. Such a wonderful program! Variations of styles and approaches and rhythms and tonalities. 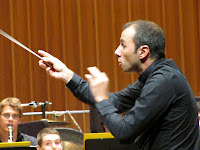 It seemed to me to be a perfect introduction to classical percussion and impeccably enticing. 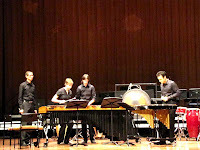 The Australian Youth Orchestra Percussion Ensemble comprised Robert Allan, Sophia Ang, Joel Bass, Catherine Betts, Rebecca Lloyd Jones, Brent Miller, Robert Oetomo and Anna Zeltzer and they were tutored by John Arcano, Ian Cleworth and Tim White. I’ve been trawling different arts and musical forms recently in these pages – pop/rap for NY Eve and AYO is in town and a blow out. 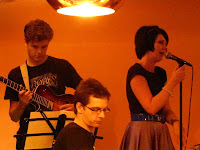 But from the jazz side, Steve Newcomb and Hannah Macklin were visiting Canberra from Brisbane and fit the bill. They performed for the first new year gig at Trinity as part of their CD release tour, and this was delightfully different. I knew what to expect. Steve had sent me a copy of the EP/CD, and I was enamoured with the delicacy and complexity of the voice, the worthy and absorbing lyrics and the ethereal accompaniment, and some whispy and musically demanding harmonies that were to-die-for. I’d wondered how they could present this out of the studio, with just two performers in a live situation. I shouldn’t have doubted. There was not a load of tech, but it was clever stuff. And the performers were a dream. Despite unplanned accompaniment of bar voices and laughter and occasional cocktail-shaker percussion, the duo carried off a subtle gig with aplomb and goodwill. Great show. Voice and words are particularly human expressions, so it’s not surprising it’s the first thing I noted. 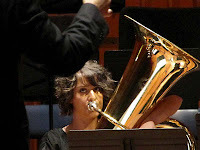 Hannah’s is a wonderfully trained and flexible voice, slipping over wildly varying intervals with pitch and precision, each note carefully formed with musical purpose, and melodic and soloistic lines that linger or move within scales and substitutions like a horn. This is not just emotion, but a clear display of high level intellectual craft. And not just written, because you hear it in her improvised interplay with keyboards, where the pair bounces fiendish little responses back and forth, each line morphing as they chatter. 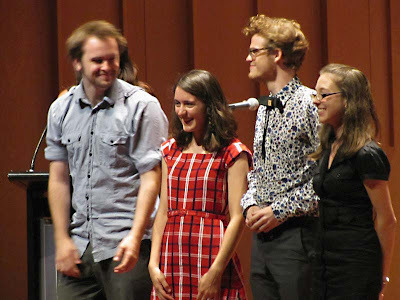 And finally those divine harmonies I’d heard on the CD; they appeared towards the end of the night, as Hannah played an effects unit with her left hand, looping and layering vocal lines as harmonies that seemed not quite so complex as those on the CD (but may have been). And not just harmonies, but also looped clicks and whistles and later mic taps for a percussion intro to one tune. Human expression but hinting of electronica. Steve was even more the electronics dabbler. Maybe he does the right hand solo thing (I think he did once last night) but he seems to me to be closer to the tune than that. I could say accompaniment, but not just that. This is interpretation where the sounds and movements of the inherent chords are explored, not just set down and played over. And not just with piano. 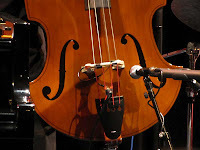 Although he mostly used Nord and Rhodes tonalities, there was a deep organ bass that often appeared in the left hand. And then later, perhaps looped, portamento slides and robot whistles and echoey squeals and squeaks and things percussive and toylike in the right. Again, bouncing from the voice, not featuring, but closely pairing for a Bjorkian otherworldliness. 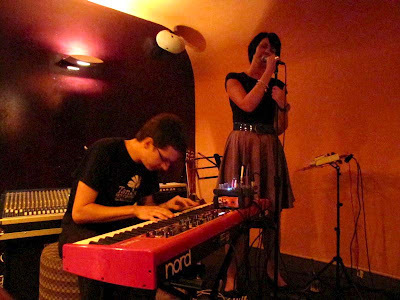 In fact, they played one Bjork number, Unravel, and the style of left hand riff and ethereal, rhythmically indeterminate overlay appeared in this and a few other original tunes from their CD. 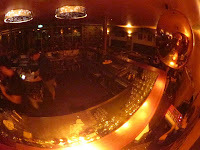 They also played Wayne Shorter, Herbie Hancock and even Otis Redding with a vocal style that I found authentically bluesy-gospelly and even growly, although the vocal timbre would have been unusual at the Blues Club. But mostly the night was originals from the EP/CD. Genuinely interesting lyrics from a mobile voice with deep grooves and that ethereal overlay. All strangely open and childlike at times, and sometimes anomalous (“Buried in the closet, underneath the vacuum cleaner … lies are skeletons” or “my heart comes undone, the devil collects it with a grin, he never returns it”) despite frequent lyrics of love and emotion. Mate Andy Campbell sat in for two tunes, but he played it appropriately restrained, so the essence of the music changed little with the addition of a few guitar solos. It was all a refreshing change, and an authentic and intriguing voice of modern Australian culture. Much, much enjoyed. 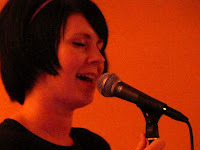 Hannah Macklin (vocals) performed with Steve Newcomb (keyboards) and Andy Campbell (guitar) sat in for two tunes.